If you were using Harmony 12.1 or earlier, it is strongly suggested that you clear your scripts before exporting animation for the first time. This will ensure there's no conflict with previous versions of the scripts and you have the most up-to-date script. Before exporting your scene, you must set the anchors and props. For more information, see Setting Anchors and Props. • Be certain to save your scene. Harmony makes the export based on the tvg files, any unsaved updates you have added will not be exported. • Set your Harmony scene to be a square resolution (ex. 1024 x 1024). Select Scene > Scene Settings. From the top menu, select Windows > Toolbars > Game. The Game toolbar appears above the Camera view, to the left. Run the script by clicking the Export to Sprite Sheets button in the Game toolbar. 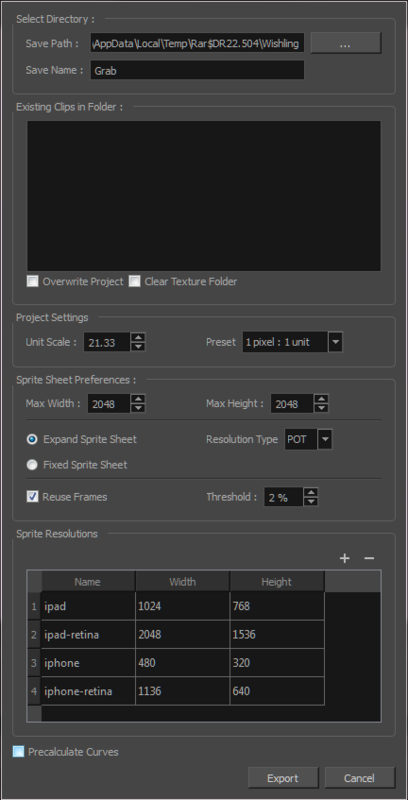 The Export to Sprite Sheets window opens. This is a value, in pixels, for the maximum width and height the exported sprite sheet should be. By default, both values are set to 2048 pixels.